Many animals are healers. For instance, science has shown that all cats from all around the world purr at the same frequency. Further, they’ve discovered that that exact frequency when applied to bone and tissue accelerates healing! Some years ago my husband and I had two cats that shared our home with us. When my husband laid down, whether for a nap or at night, one specific cat, TuffyTiger, would go directly to his chest and liver areas and start to vigorously purr. She would eventually settle and rest with him, all the while purring loudly. We thought it was the cutest thing. This went on for well over a year. Each time he laid down there TuffyTiger would be, always purring. My husband wasn’t feeling any pain or showing any signs of illness, so we just thought she was being very loving toward him. He got to where he sought her out because he always felt so peaceful and relaxed, and said he could sleep better with her there. He also said he noticed that he would wake up from their time together feeling more refreshed. 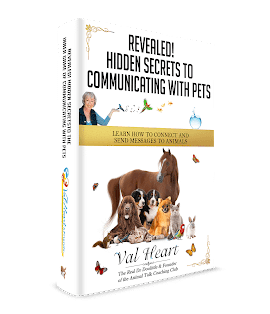 Val Heart is an animal communicator who works with health and behavior issues with animals. After almost 18 years of marriage, my husband and I divorced. Shortly afterward he noticed pain in his chest and stomach, and only then did they discover that he had liver cancer. Within 10 months he passed away from cancer. We didn’t know it at the time, but my husband had cancer throughout his body. TuffyTiger had been healing and working with him for over 10 years, and had successfully been keeping cancer at bay with her purring and earnest, loving ministrations. The next time a cat gifts you with their purr let yourself feel how deep into your own body the vibration goes. Also notice where it is directed. Often a cat will specifically choose where it sits with their human friend(s) – and the site is usually a problem area. It could be a knee, organ or injured area that your friend is attempting to help you with. I’ve even seen cats who literally configure their bodies to flow the energy in a specific pattern, channeling degenerative and destructive energy lodged in areas. Take a moment to thank them, offering gratitude for their ministering to you. Breathe with the purr, and allow yourself to vibrate as deeply as possible. For all you know, they are healing you in the same way that shamans and healers have for centuries! If you enjoyed this article, you’ll love my expert animal communication eTips. Subscribe today!